We lived in Ireland for 6 years and we celebrate all St. Patrick's days with feast. Starting the day in the street at the parade and then in the pubs with Guinness and traditional Irish food was the way to celebrate. Saint Patrick's Day is a religious holiday celebrated internationally on 17 March. It is named after Saint Patrick the most recognized saint in Ireland. The first Saint Patrick's Festival was held on 17 March 1996. 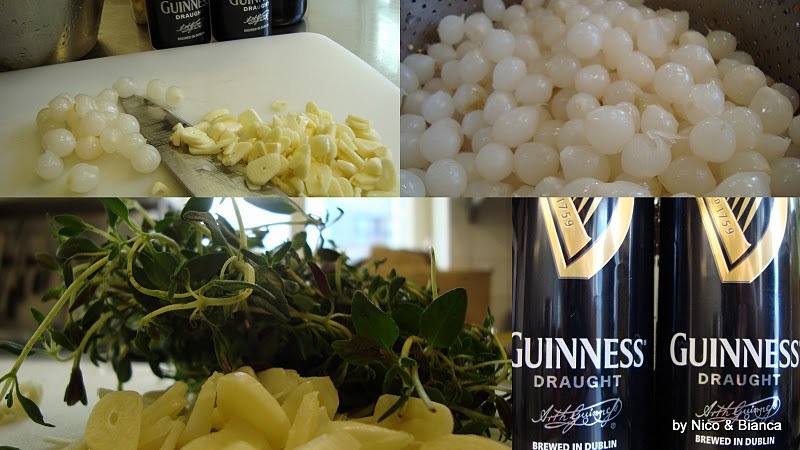 Here I share with you the recipe for ‘’Beef and Guinness’’ that I know from Ireland. In the restaurant I worked there, we use to make this stew in every St. Patrick’s days. I made this today here in Estonia to remember those good days and was very good. This traditional Irish recipe uses the dark, malty flavour of Guinness beer to create a stew with a rich, meaty flavour which improves with time. Best to be made 1 days in avans . Set the oven to 180ºC. Place some of the meat into a tray and generously season with salt and pepper. Dust it with some flour and mix it a little with your hands. Repeat with the rest of the meat. Place a saucepan on high heat, add the oil and butter and allow them to melt. When hot, add some of the beef cubes. Cook them in batches. You don't want to over crowd the pan, or they won't cook evenly. Let them brown for a couple of minutes, each side, remove and place them into a tray. Repeat with other batches until all the beef is browned. Add a little more oil into the pan followed by the onions. Next add the bacon, carrots, celery and pearl onions. Stirring occasionally, let them cook for a few minutes until slightly softened. Return the meat to the pot along with all its juice. Add the Guinness beer and the stock. Bring it to a simmer. Skim the surface to get rid of any impurities or excess fat that will accumulate on top. Once it begins to simmer, add the tomatoes, garlic, thyme, bay leaves and the allspice. Give it a stir and cover it with a lid. It is now ready to place into the centre of the preheated oven. Leave to stew for two and half to three hours. Half way through the cooking process, remove the lid and allow it to cook uncovered to reduce the liquid. After the cooking time, remove from the oven, garnish it with the chopped parsley. It goes well served with mash potatoes and puff pastry lid if you wish . Today I use some garlic croutons and rocket salad drizzle with trufle oil.